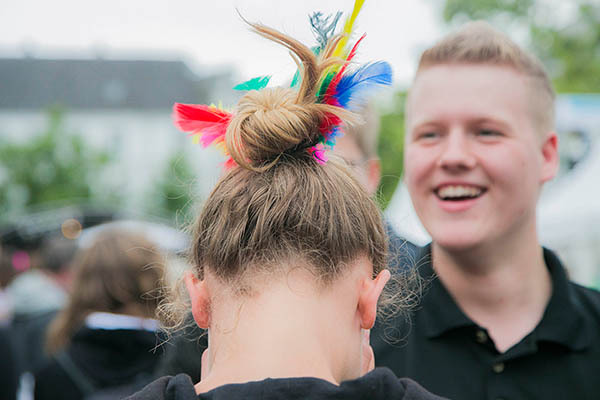 A new study, entitled “Young – Active – Protestant in North Rhine-Westphalia!”, reveals that the Evangelical Church offers a valuable contribution to the vibrancy of the local community through its youth work and confirmation classes. In his presentation of the results of the survey, for which he was responsible, Professor Dr Friedrich Schweizer, lecturer in Religious Education at the Protestant Faculty of Tübingen University stated that “Voluntary activity in the church is not just an internal church affair”. Rather, it was the case that young people were involved to a considerable extent in a wide range of areas both inside and outside the church. The survey has shown that voluntary work is in no way something just for the Third Age, which is a widespread perception in the church. Rather, it is precisely those aged 14 – 24 who are most heavily involved in voluntary activity. Where does the stimulus for this strong involvement come from? One of the grounds for it lies in the work done in confirmation preparation classes. “Young adults in North Rhine-Westphalia give a higher significance to their confirmation preparation than is the average across the Federal Republic”, said Dr Schweizer. During work placements, which is a feature of confirmation preparation in many local parishes in North Rhine-Westphalia, young people can try out voluntary work, which has a very positive effect on their involvement later on. As a second reason for the commitment, Dr Schweizer referred to the voluntary activities of Christian families. His theory was that “Volunteering is hereditary”. The Evangelical Churches in North Rhine-Westphalia had commissioned the survey “Young – Active – Protestant in North Rhine-Westphalia!” from the professor of Religious Education at Tübingen University in the context of a nationwide survey on the involvement of young people in society. This representative survey in NRW involved the questioning of 1100 people aged from 18 to 26 years. It gives an indication of the ongoing effects of the confirmation preparation period. In local church parishes in North Rhine-Westphalia it is above all the practical work placements during confirmation preparation that have a long-term influence on attitudes to voluntary work. In this way confirmation preparation work also makes a valuable contribution to civil society. In contrast to young people in other Regional Churches and other Federal States, the survey emphasises that young adults in North Rhein-Westphalia with a church background are more heavily engaged in all areas of social involvement than the whole of their age group. “However, the voluntary commitment of young people is also a nationwide phenomenon, and in this respect many of the findings in NRW are also evident in other Federal States”, said Dr Schweizer. “For the young people in NRW, faith plays a stronger role as a topic. At the same time they feel that they are being used to a greater extent within the parishes”. In addition, it is here that they have particularly good opportunities during their confirmation preparation to try out voluntary activities, which tends to have a very positive effect on ongoing involvement later. In comparison with other Regional Churches, the Evangelical Churches in North Rhine-Westphalia were however worse in what they offered young people following confirmation. Here the local churches had a lower than average contact with their young people, which Dr Schweitzer said needed further clarification. Young adults felt that they were less valued in their church communities than was the case with other churches. They had little opportunity to contribute their skills. “In particular, confirmation preparation classes and other church youth work make an essential contribution to this”. Out-of-school education begins in the Protestant children’s day-care centres and continues with facilities offered for children, young people and young adults.